Something really glorious is happening in my studio. Two of my favorite orchids – my Paphiopedilum Haynaldianum and my Brassolaeliocattleya Greenworth Hybrid- are about to bloom simultaneously any day now. 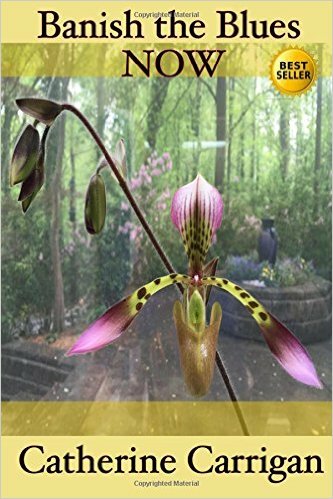 The Paphiopedilum Haynaldianum graced the cover of one of my recent Amazon No. 1 best sellers, Banish the Blues Now. 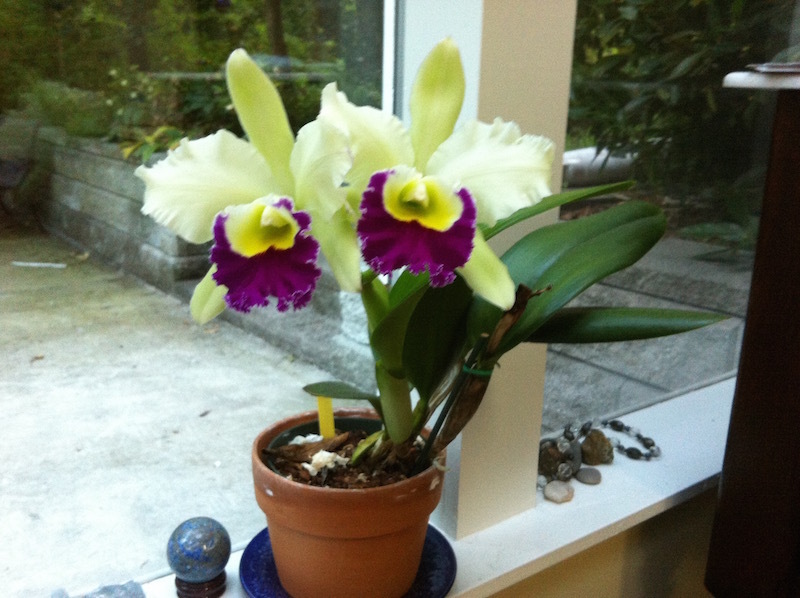 I haven’t yet put my chartreuse cattleya on the cover of anything, even though it has bloomed an amazing six times before and was my very favorite orchid until two paphiopedilums crowded the field (my Haynaldianum and my Fairrieanum). What’s interesting to me is that these two orchids seem to have synchronized with each other. Back in the day before I reached menopause, my favorite yoga students and I would all suffer our periods together. We would all tromp up the stairs on the way to class holding our bellies at the same time. Even though I got the cattleya first and the paphiopedilum afterwards, they have shared the same table in my studio for years. Standing side by side, they share similar amounts of sunlight, receive water and fertilizer on the same schedule and enjoy equal amounts of my admiration and constant amazement. Although I cherish all my orchids, the others tend to bloom in random order, not seeming to notice what’s going on with the phalaeonopsis or cattleyas by their side. Scientists estimate that in the animal kingdom, social interaction may be what causes animals living in groups to synchronize their behavior. Paphiopedilum Haynaldianum and Brassolaeliocattleya Greenworth the last time they bloomed together. All living beings have complex body rhythms, whether that be the heartbeat of a lamb or opening and closing of a morning glory. 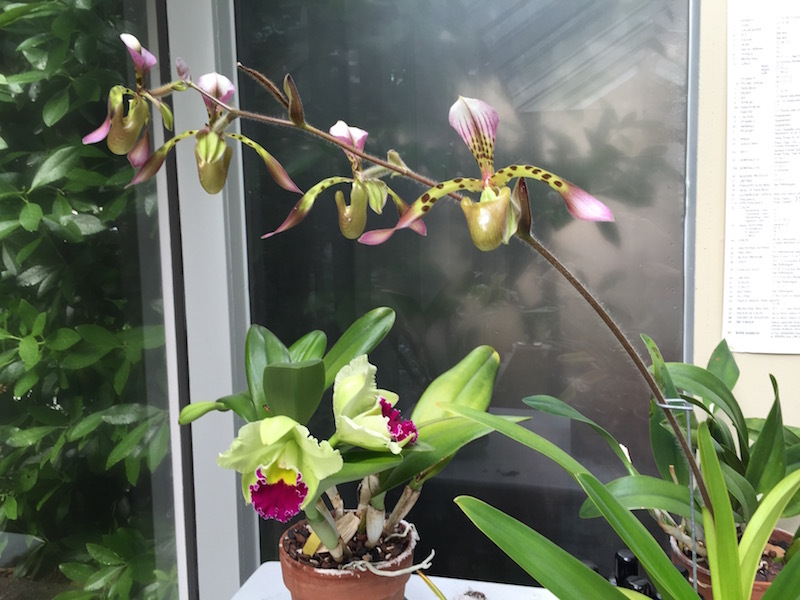 On orchid forums, enthusiasts suggest that if you want your orchids to bloom all at once, repot them simultaneously. Although I have repotted my Cattleya Greenworth – a process that required some bravery on my part as I did not want to injure it in any way – my Paphiopedilum Haynaldianum is still happy in his original pot. Other orchid enthusiasts suggest that blooming en masse is an evolutionary strategy to attract the most insects. But here’s my outrageous, totally unsupported theory – orchids have friendships, just like we humans do. I will often find my orchids growing towards one another, reaching as it were, to enjoy a bit of lively conversation. Even when I turn one more towards the sun and the other away, they tend to grow back together no matter how I try to interfere. 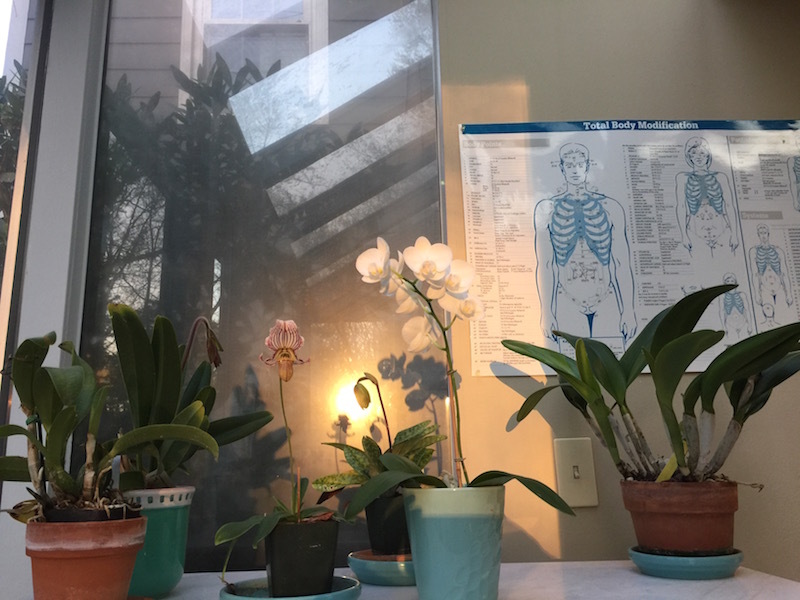 I pointed this out to my dear friend and yoga teacher Lillah Schwartz when I was visiting her home in Asheville, N.C.
Lillah laughed until I pointed out her orchids in the window and how they seemed to be growing en masse as one friendly organism, even though they were all different varieties in assorted colors of pots. Personally speaking, I don’t know where I would be without my friends – I rarely go even one day without chatting with one or another. I think it must be the same in the orchid kingdom. Friend: People go to a psychiatrist to talk about their problems. She just needed to unload them. You know, bring them out in the open. Crocodile Dundee: Hasn’t she got any mates? Friend: You’re right. I guess we could all use more mates. I suppose you don’t have any shrinks at Walkabout Creek. Crocodile Dundee: Nah – – back there, if you got a problem, you tell Wally. And he tells everyone in town… brings it out in the open… no more problem. Of course, I water, I fertilize, I pay attention. 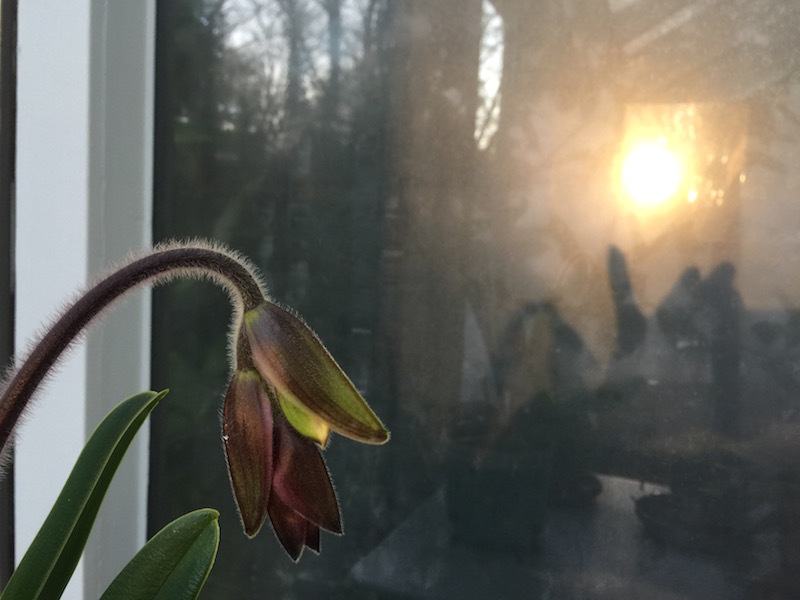 But to me the real secret to getting orchids to rebloom is friendship – my friendship with them and their friendship with each other.